Teachers often assign group work as a way to motivate and engage students in the learning process. There are two types of student reactions when they hear that there is a group assignment. “Yessss!” is the typical response from the free-loading student who is excited that someone else will carry the weight of the project. A slumped-over long exhale is typically the response from the students who care enough about their grade that will ultimate carry the weight and work load of others in the group that decide to not contribute. This dynamic of response to a group project is typical given the average parameters surrounding group work. The teacher usually lays out criteria that will be assessed in the final project and the grade that is earned will be distributed to all students in the group. Have students use different color pencils/dry erase markers/etc when contributing to group work so that the teacher can quickly glance from group to group and monitor that all members are contributing. “Ask three before me” encourages students when they have a question or need clarification that they should ask at least three other classmates before asking the teacher. This cuts down on the teacher running from student to student with their hands up in a class session. If a hand goes up, likely four hands should go up because all of them have the same question and the teacher can either answer it once to the small group or may wish to address the whole class since so many had the same question. Clearly define roles and responsibilities for each member of the group. Depending on the scale of the project, the teacher may wish to give names/titles to certain roles for each group member. Albert Einstein said, “Everybody is a genius. 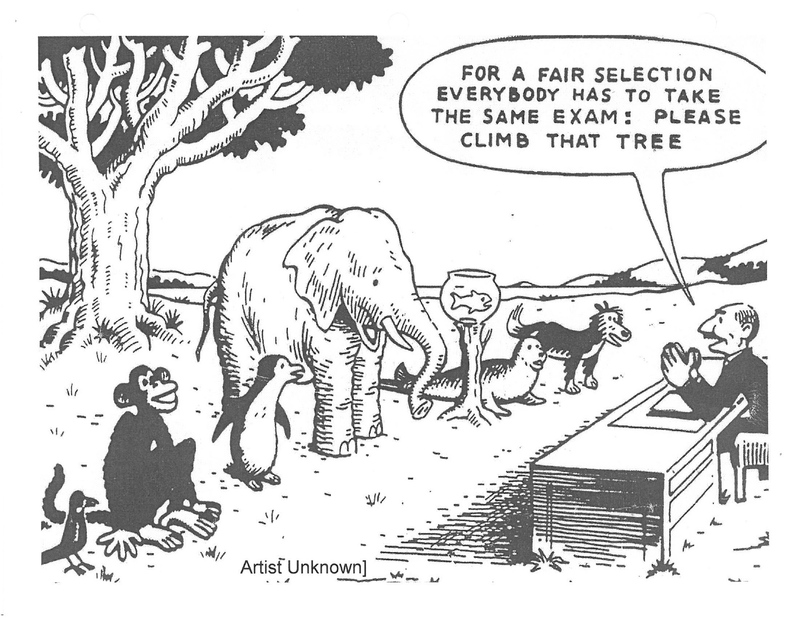 But if you judge a fish by its ability to climb a tree, it will live its whole life believing it is stupid.” Research tells us that teachers teach and design assessments based on how he or she would learn and perform best. We often fail to incorporate such things as Howard Gardner’s Theory of Multiple Intelligences. There is power in offering students choice so that they can shine in their strengths while demonstrating the competencies you wish to measure. Teachers must switch their mindset from thinking about the successful completion of an assessment to thinking about the successful demonstration of concepts or skills. A teacher must identify the concepts or skills they want the students to master and then allow students the opportunity to demonstrate that knowledge or skillset in a variety of ways. Using the Theory of Multiple Intelligences as the ground work to tap in to different learning styles, this could be done through visual displays, role-playing, written work, presentations, concept mapping, music, etc. This also shifts a teacher’s perception that all students must submit the same “type” of assessment. Again, if the concepts and skills that are being measured are clearly defined, a teacher can assess a student through a variety of assessment products. Students are able to better demonstrate their understanding of the material by presenting it in a manner that makes the most sense to them and teachers are able to experience a renewed excitement for grading since each assessment is very authentic. For example, if a teacher wants the students to know information about slugs, he/she would identify the specific aspects about a slug that he/she wants to assess. The actual assessment can vary based on students’ strengths, interests, and abilities. Rather than having all students write a report in which the teacher looks for certain content aspects, or has all students give a presentation where the teacher listens for certain content aspects, the students will submit a wide variety of assessment products. One student may choose to write a creative story incorporating the slug facts to be assessed. Another student may choose to write a song about slugs. Some may choose to create a visual display or model of a slug and its habitat in order to convey the assessed facts. One rubric could be created by the teacher and used in all assessment scenarios. It makes the rubric focus on the knowledge of the content or skills rather than the completion of the assessment. No longer would a student get marked down for poor presentation skills when they understood the content very well. They may choose to display their knowledge in a written poem instead. Choice by Design allows teachers to assess students on the product not the process. Cooperative learning is an instructional approach that allows students to learn material in small group settings but with individual accountability and assessment. 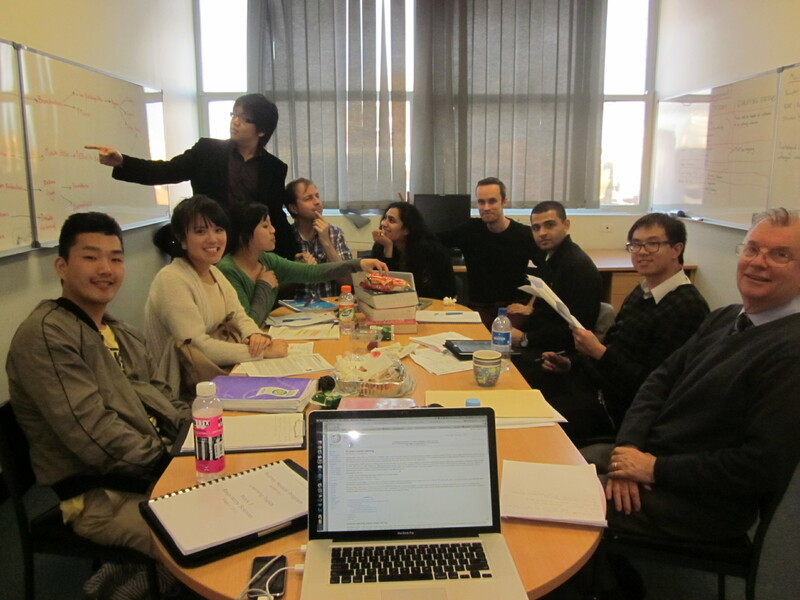 In a cooperative learning environment, students are arranged in small groups of four. The teacher’s instruction is constructivist by building in many engaging structures for the students within the delivery of content. It is optimal for the teacher to not spend more than fifteen minutes of direct instruction of content before interjecting a cooperative learning strategy that will allow students to engage and apply the material. Cooperative learning strategies allow the students to talk and/or move while completing a task related to the application of content that was just covered. Some cooperative learning strategies can be as quick as one minute, and some can take up to ten minutes. All strategies involve the use of time, therefore creating a sense of urgency among the students, which leads to focus on the activity at hand. An example of a cooperative learning strategy that can be incorporated into any classroom, regardless of whether students are arranged in small groups of four, is shoulder partners/face partners. After the teacher has been lecturing on content material for fifteen minutes, he/she can tell the students to turn to their shoulder partner and recap three main ideas covered so far. This small transition is so powerful in reengaging the brain and then allowing the students to come back and focus their attention on another fifteen minutes of lecturing. We must allow time for students to process information. Forty-five minutes of continuous lecturing is too much for the brain to process. Time for reflection and application must be built in intermittently. There are over fifty other examples of cooperative learning strategies that can be incorporated into lessons in order to engage students and give them opportunities to apply the content material being learned. Utilizing cooperative learning strategies into instruction requires a shift of perspective from a teacher-centered classroom to a student-centered classroom. The dynamics of the classroom change once this sift in perspective occurs. Students will begin demonstrating accountability for their own learning and will demonstrate more focused attention on the direct-instruction being delivered.